Professional chainsaws have certain qualities that make them different from the ones most often used by beginners. The qualities and features that come with professional models are that they are made a little more heavy duty and are built to withstand longer and heavier use than a beginner model. In addition to this, most professional chainsaw models have been designed to be more efficient, durable and safe. And they can often help you make more chips faster as they offer a lot more power than lesser models. Remember, if you’re going to use any type of chainsaw, it is extremely important for you to know how to use a chainsaw properly. 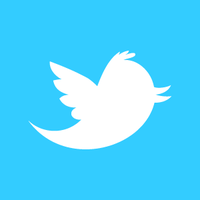 While we may earn a very small commission if you purchase something through one of our links, we have included our reviews based on our experience below to help you make the best choice you possibly can. As I briefly touched on before, the professional ones have a lot more power than the ones used by beginners and because of this they vibrate more. Another thing of note is that the professional models will often allow you to change the size of bar and chain – either longer or shorter. This can be important in allowing you to use a bar and chain that is best suited for the job and type of cuts you’re going to be making (IE shorter chains and guide bars for fine cuts or larger ones for falling big trees). Here are five of the top professional chainsaws. This particular chainsaw is designed or heavy duty use and it is considered to be one of the most powerful ones around. This is due to the fact that it gets its power from a 59.88cc two stroke engine which provides it with ample power to cut through almost any type of wood. Its total weight is 20.1 pounds and it supports five chain and bar sizes which are sixteen inches, eighteen inches, twenty inches, and 24 inches. This gives the user more options to choose from depending on the kind of wood they are cutting or the job they plan to do. Another important quality of this particular chainsaw is that its starting mechanism is electronic which allows it to be used in different weather conditions. This is complimented by the fact that it comes with a decompression valve which makes pulling the rope much easier. While using this particular commercial grade chainsaw one can easily gauge the fuel level without having to open the tank through the translucent gas tank – which is a really great option. It also has lower amount of vibration when compared to other saws of this size which means you won’t tire out as quickly as you won’t be fighting a vibrating saw the whole time. 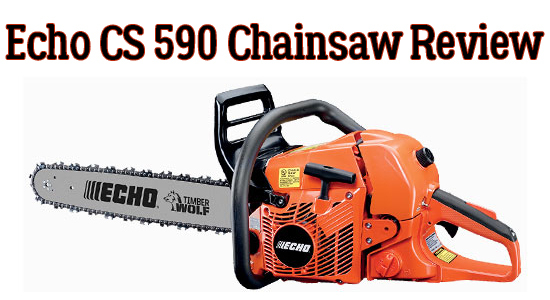 Click here for the best pricing on the Echo 590 chainsaw and other reviews. This particular chainsaw is gas powered and it uses a 3.6 HP 60 CC engine which runs in two cycles, which gives it the perfect amount of power to tackle the majority of wood cutting duties you’re likely to come across. It comes with a chain tensioner that is mounted on the side and helps adjusting the tension quite a bit easier. Another feature that makes this particular chainsaw unique is that it also has very little vibration when compared with others of the same size and performance. This professional chainsaw can be used in all weather conditions due to an intelligent air injection system that is complimented by smart start technology. It also comes with a crank shaft with three pieces which enhances its durability. It has a solid design which allows you to handle it easily regardless of the angle you’re cutting on. 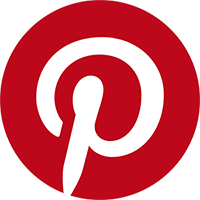 The fact that it is echo friendly further makes it an extremely popular choice among competitors as it does not negatively effect the environment. It’s because of these features that it’s considered one of the top professional chainsaws. Husqavarna Chain Saws have a long history of developing tough, rugged saws and this is one of them. 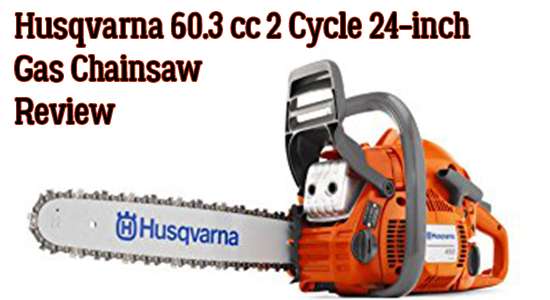 Click here for the best pricing on Husqavarna chain saws including theHusqvarna 60.3 cc 2 cycle 24 in gas chainsaw. This is a gas-powered chainsaw that gets its power from a two cycle 51 CC engine. The engine can provide it with sufficient power without the need to produce a lot of noise. The chassis is die cast which is an important feature as it enhances the durability of the chainsaw. It also has anti-vibration handles that play an important role in making sure that the vibration while running isn’t felt by the user. These handles are placed both at the back and on the front. Another nice little feature is that Remington has designed it to be switched on and off at any time and in any weather. This particular chainsaw weighs in at twenty-five pounds and has bucking spikes which are longer than the ones found in similar competing models. It also comes with brakes that are inertia activated to ensure that the user has better control during use. It also comes with a case to carry it in while not in use – which is very nice if you ever want to carry it inside a vehicle rather than in the back of your truck bed. This way you won’t get bar oil all over your vehicle’s interior. It’s designed to be able to handle virtually any size of wood you’ll come across, making it ideal for heavy duty use. 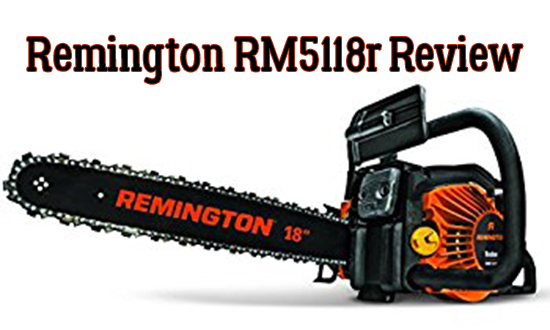 Click here for the best price on a Remington RM5118r including more reviews. This is another professional chainsaw that is designed for high performance use at any time and in any conditions. This particular saw has a long history of top quality performance and is well respected in the market. It features a 50 CC two stroke engine which uses modern technology to help it use about twenty percent less gas while at the same time reducing emissions by about seventy percent. The manufacturers of this chain saw have also incorporated a pull start system which makes starting it very simple. It comes with a standard 20-inch chain and bar which gives it the best level of efficiency while being able to cut almost any type of wood. Its total weight is only seventeen pounds, making it very easy to transport and use the whole day without getting unnecessarily tired. The design of this professional chainsaw lends itself more towards that of heavy duty logging and tree falling than most homeowner models. 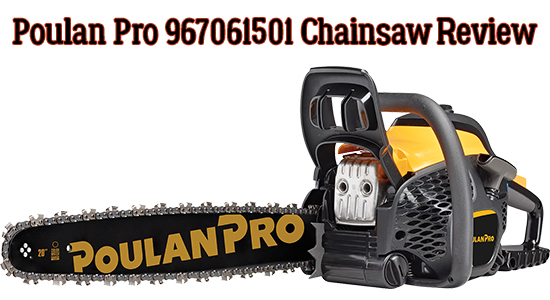 Click here for the best price on a Poulan Pro 967061501 Chainsaw including more reviews. This particular chainsaw is powered by a 50.1 CC engine that provides gives it a tonne of power. Despite the engine having that much power, it produces minimal emissions which goes a long way in doing its part to help eliminate unnecessary impact on the environment. The decompression valve on this chainsaw makes it easy to start without a struggle. It is designed in a way that the handle is on the rear side which is very helpful when handling it. Changing the chain, filter or the bar is easy and can be done by almost anyone without the need for tools which makes adjustments in the woods a breeze. This particular professional chainsaw also comes with an anti-vibration mode which makes it much more comfortable to use. Its total weight is just 17.6 pounds so it’s not particularly heavy and will allow you to use it without getting too tired. This professional model wants nothing more than to cut through logs and thick branches without any sort of issue making it the perfect candidate for almost any heavy-duty assignment. 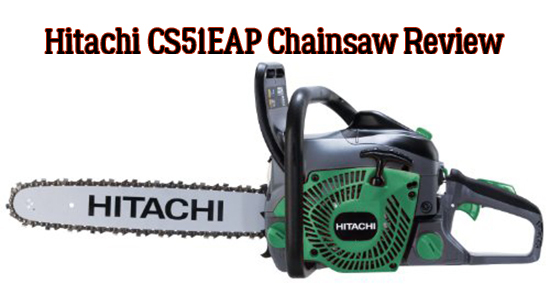 Click here for the best price on a Hitachi CS51EAP Chainsaw including more reviews.